Despite his fame and reputation in Japan and presence in international survey shows of Japanese photography in the 70s and 80s, Shōmei Tōmatsu was relatively little known in the West until quite recently. A 2005 touring retrospective of his work in North America and Europe placed his work in the canon of 20th century photography. Tōmatsu’s artistic vision was shaped by the devastation caused by World War II in Japan, which he witnessed as a teenager. Fascinated by all aspects of the world around him, his camera sought to capture humanism regardless of the subject matter. In his often haunting photographs, Tōmatsu strives to relay a truthful record of reality while retaining a boldly expressive point of view. 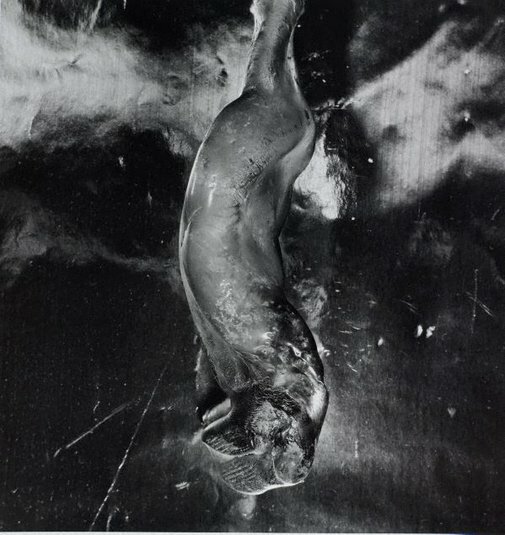 ‘Bottle melted and deformed by atomic bomb heat, radiation and fire, Nagasaki’ 1961 is part of a group of photographs, commissioned by Japan Council Against Atomic and Hydrogen Bombs. The ubiquitous beer bottle, photographed in Nagasaki’s Museum of Remembrance, has been mutated beyond recognition by the atomic blast, becoming nakedly organic in its deformation. Foregoing a purely documentary approach, Tōmatsu records history in metaphorical terms. His hallucinatory image highlights the magnetic power of an object that witnessed an event so momentous that it can only be imagined. 1. Shōmei Tōmatsu, ‘OO! Shinjuku’, Shaken 1969, back cover. Signed and dated l.r. verso, pencil "1961 '74 Tom/ ...".